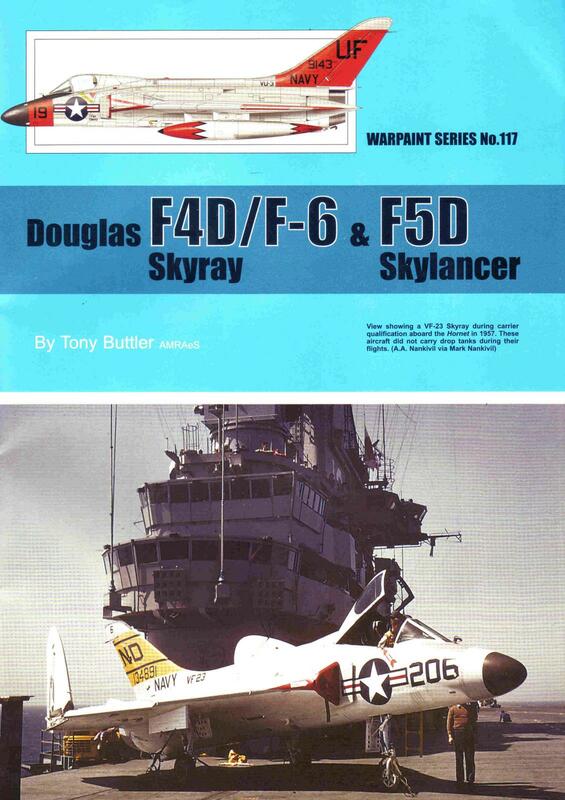 Guideline Publications newest release is No.117, Douglas F4D/F-6 Skyray and F5D Skylancer. This is a softbound book of 58 pages and is very well illustrated with both color and black and white pictures, line drawings and many color profiles. 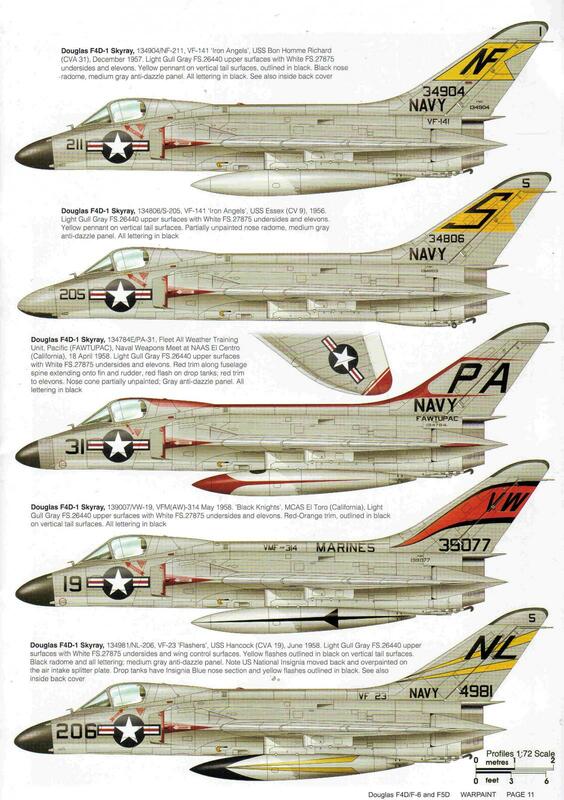 I love this era of aircraft with lots of colorful schemes in Gull Gray and white. This book is a great reference so let's take a look inside. The book starts with the development and teething problems of the F4D mostly due to the planned engine not being ready and the test engine being underpowered. There are several excellent pictures of the prototype which, interestingly enough, was painted over all Sea Blue. When the fuselage size was increased, and the larger engine installed, the program took off and the shape is one familiar to modelers. The program progressed through carrier trials and acceptance and its eventual deployment. 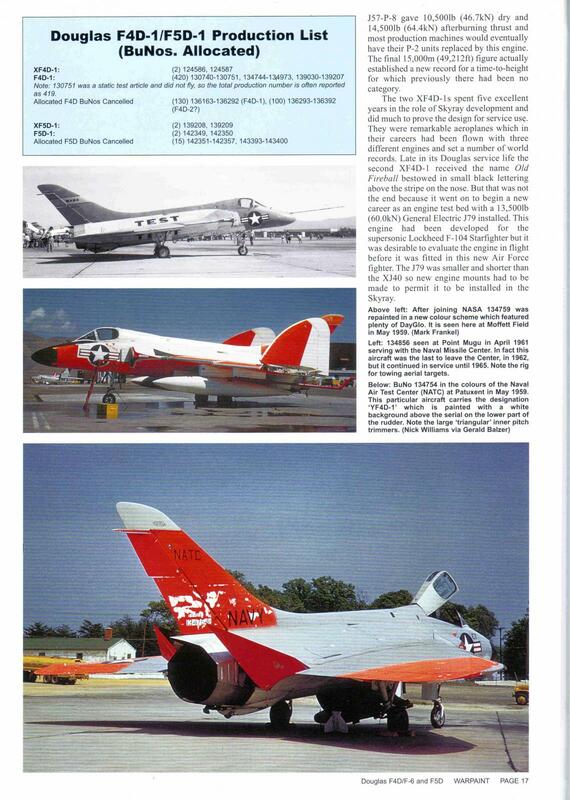 One fact I didn't know is that the F4D held the World Air Speed record of 753 mph on October 2, 1953. It also time to height records and other speed records. All very impressive for what is now one of the lesser jets and especially so with the engine technology of the time. The next section of the book covers the actual production variants of which 420 were produced. 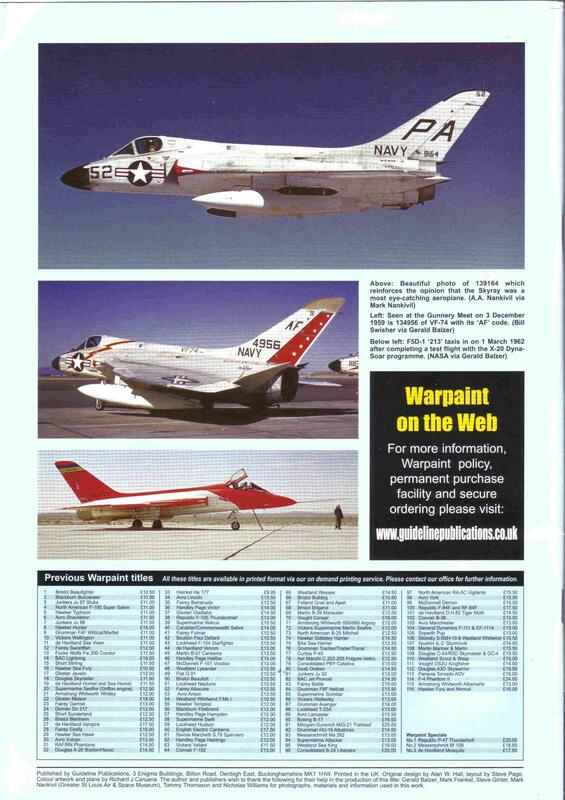 It also covers deployment, details of its avionics and capabilities and this section is wonderfully illustrated with operational photos both on and off carriers. Also included is a scale plans in all views drawn by Richard Caruana. Interspersed amongst this section and the rest of the book are 35 side color profiles and a page of color top profiles. These are all superbly drawn by Mr. Caruana. 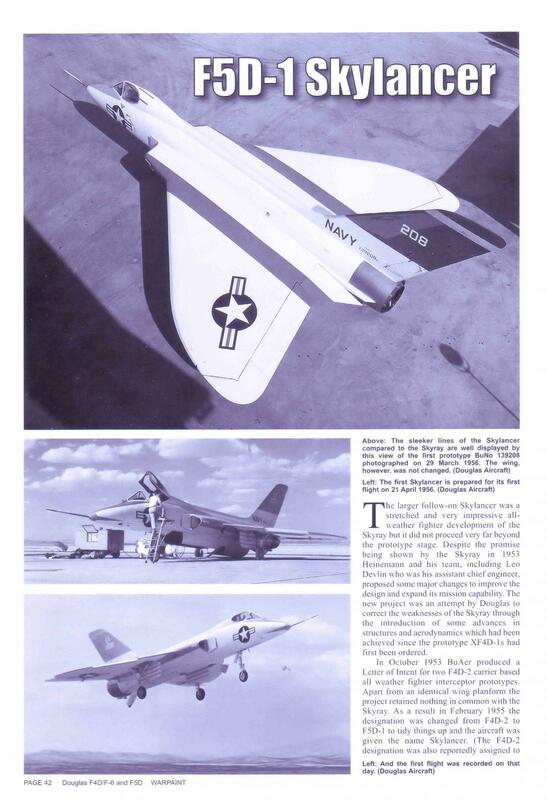 The next section of the book deals with the F5D-1 Skylancer. 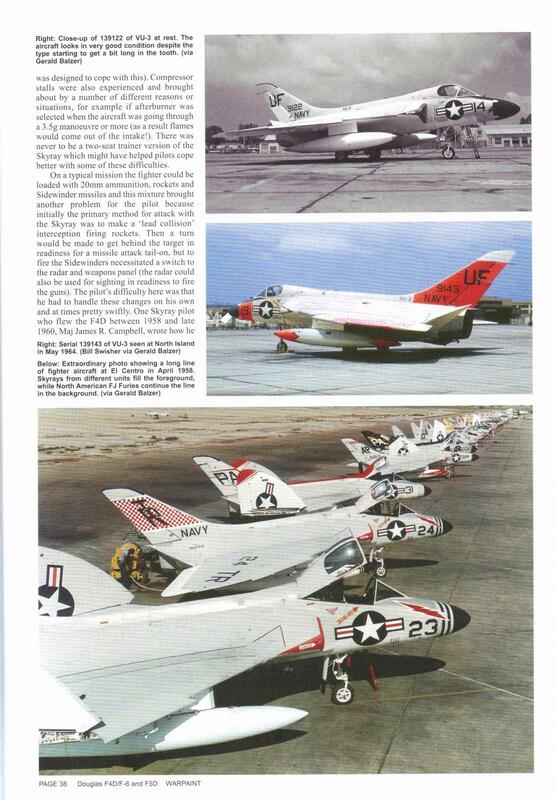 While this plane was in basis an upgraded and extended Skyray. The fuselage was 8 feet longer and the wings were thinner (although similar in configuration). The plane also included upgraded avionics and armament control. There were only two prototypes made and there are some great pictures of the plane. Also included are two sections specific to the modeling community. 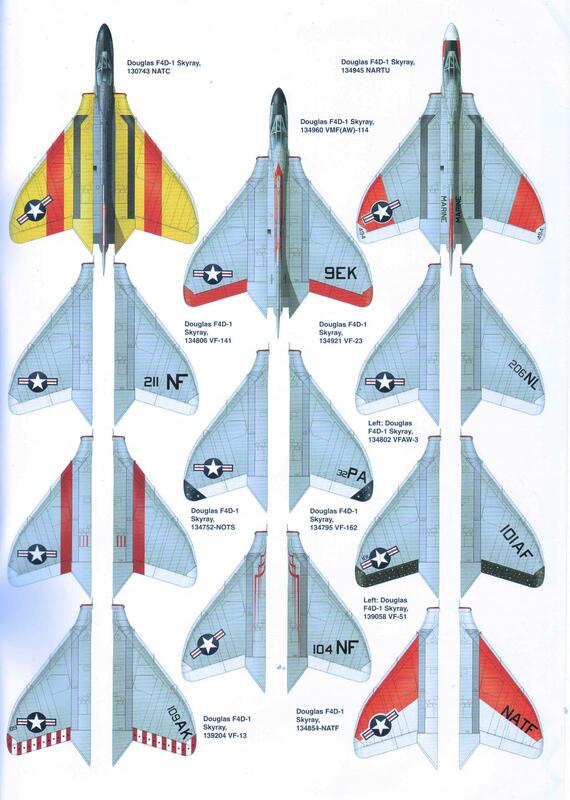 First is a two-page close up walk around of the F4D Skyray and an entire page of every Skyray/Skylancer kit, aftermarket and decal set released with descriptions of each set. Whether you like the historical side, need detail shots or want to research markings, this book is awesome. And it includes a modelers section to find what you are looking for to build that kit. Most highly recommended for a very reasonable price. My thanks to Guideline and IPMS/USA for the opportunity to review this excellent book.